"A raw, disarmingly honest writer and a fearless reporter, willing to go just about anywhere -- to the abandoned tunnels of New York, to the sketchiest bars and clubs, into the chaos of ground zero on 9/11... Buzzell is the rare nonfiction writer who seems equally at ease recounting stories about himself -- his war experience, his struggles with alcohol addiction and post-traumatic stress -- as he is writing about others... a gonzo journalist who makes an art of hanging out." "Thank You for Being Expendable," moves past the war to the struggles of a veteran trying to adjust to civilian life, struggles that are all too common among the troops he sees returning home." "A must-read for anyone interested in what the intersection between military life and counterculture looks like…Few writers capture rejection from society quite so succinctly. However the converse is also true, as Buzzell waves the flag of defiance proudly in the face of nearly every American civil institution... stitching together the rottenness of respectable America and the misery of underclass America, the uselessness of a war that didn’t accomplish anything, and a personal experience of service and combat that beguiled him at first only to ruin him later... ."
"Thank You for Being Expendable is an impacting collection of stories that document the author’s transition from military to civilian life... Buzzell is blunt and spares no one–place, person or himself. He writes like he’s talking to a friend, trusting readers with his hopes and struggles... Throughout the stories, he raises pertinent questions about the struggles veterans face... gripping." “25 nonfiction military authors that really bring the war home to those who remain stateside... Colby Buzzell — His memoir, “My War: Killing Time in Iraq,” was based on blogs he wrote from the front lines as an Army infantryman in Iraq in 2003 to 2004... Thank You for Being Expendable” is a collection of essays on a veteran adjusting to civilian life. Buzzell’s writing has been praised as being visceral and often profane at the grunt’s eye level." Thank You For Being Expendable and Other Experiences is an anthology of stories from Iraq war veteran and critically acclaimed author of My War Killing Time In Iraq, Colby Buzzell. From curious observer, to disillusioned combat veteran, to hardened new journalist, Buzzell sheds light on the veteran’s post-war journey back home. Thank You For Being Expendable, a decade worth of stories, thirty-six in all, show one man’s ongoing quest for answers. Thank You For Being Expendable captures the author at various high and low points in his life: battling alcohol addiction and searching for sanity in a broken VA system, being labeled with Post-traumatic Stress Disorder, traveling the country to understand the state of our Union, ordering countless tamales in the Mississippi Delta, living in San Francisco’s rock bottom Tenderloin District, witnessing Chinese capitalism at its best up close and personal, and experiencing the horror of the September 11th attacks from ground zero. Buzzell has told the stories many chose to ignore. His writing is honest, blunt, unfiltered and totally unromantic as he tells these stories through a lens of a veteran who’s damned to see the world in which we live in a slightly different angle than most others. What does it mean to be expendable? "I remember reading Colby's journal entries on the internet when he was filing them from Iraq. I was amazed at how heavy the material was but what really knocked me out was how sharp and vividly intense his writing was. My War is the real deal reportage from the ground. There's no way any reporter could have brought this back. If you care about our brave soldiers in the fray and want to get an insight into what it's really like out there, My War is essential reading." "Endlessly surprising...delightfully profane... an unfiltered, often ferocious expression of his boots-on-the-ground point-of-view of the Iraq war." "If, in 20 years time, people want to know what it was like to fight in Iraq, they can pick up 'My War' and find out. It tells what it's like to be a grunt fighting in the Sunni Triangle - with more power and authority than the best 'embedded reporter' could manage. It is something of a triumph for blogs over traditional media." "My War is breathtaking. His self-awareness is total and unromantic, his instinct for what matters unrelenting, his writing lyrical, heartbreaking, hilarious, and essential. We can read a thousand dispatches from Iraq, but we will never know the war-or ourselves-like we will after reading My War." "Incredible accounts of combat from a grunt's-eye-view." "The most extraordinary writing yet produced by a soldier of the Iraq war"
"My War is perhaps the finest and most genuine writing to come so far out of the war in Iraq, uncompromising in both its criticism and its praise, willing to admit the ugliness of violence and the exhilaration that it breeds." "Buzzell's account of military life as a grunt in Mosul, My War: Killing Time In Iraq, is like no war diary written before. Blunt, brutal, foul-mouthed, and immediate. "In gutsy, sometimes profane prose, he takes you on a soldier's-eye view of the front lines of the war." "Remarkably blunt, honest and often hilarious." "Striking....Buzzell tells the story of his year in Iraq with a steeliness that's both sincere and chilling." "Profound, profane....told with irresistible gallows humor and anger devoid of self-consciousness. Give[s] us a much deeper understanding of the war." "My War" is the story of a young grunt trying to survive boredom and death in a war zone...What you soon realize about this stranger at the bar, Colby Buzzell, is that he can knock you off your barstool at a moment's notice with soul-jarring observations and darkly comedic insights into what it really means to be fighting and idling in this war." "Funny, often surreal "What the @!%# am I doing here?" account of military life...(Grade: A-)"
"Raw, sardonic, and thrashingly honest, My War is a stellar grunt's-eye view of the Iraq war." "Buzzell's My War, written in a style reminiscent of Hunter S. Thompson and Allen Ginsberg, is fueled by an antiauthority, punk-rock attitude." "Military recruiters won't be handing My War to prospective soldiers, who would do well to read one grunt's account of what they could be getting into." "Several other books have come out during the war... What makes "My War" stand out is the author. The way in which a punk-rock skateboarder navigated the Army gives him a compelling voice and take on the Iraq war." "My War: Killing Time in Iraq... the most charming and funny of the memoirists"
"The war in Iraq may be far from over, but it has already produced a small crop of books by soldiers who fought in it... Colby Buzzell is perhaps the best storyteller, and without a doubt the funniest." "My War is all about immediacy, and it's an invaluable reference to the current war"
"Sensational book... Buzzell is in the habit of telling it like it is, a skill he uses to great effect in this tragi-comic account of 'Joe' (Infantrymen) life in Iraq... In My War, he records his experiences with a mixture of irreverence and awe, like a latter day Holden Caufield who suddenly finds himself behind enemey lines"
"Provid[es] more truth than CNN or the army could or would." "Captivating memoir about the year [Buzzell] spent serving as an army 'trigger puller' in Iraq....though the combat scenes are exciting, this book is actually more engrossing as a portrait of the day-to-day life of a young American soldier." "Reminiscent of Michael Herr's Dispatches." "While deployed as an Army machine gunner in Iraq, the iconoclastic Buzzell kept an anonymous blog that chronicled his wartime experiences. His cynical but captivating memoir expands on those viscerally frank (and sometimes profane) postings." "Far from the stereotypical scribbling in a trench, this memoir began as a blog while Buzzell served as a machine gunner in Iraq. Tasked with locating and killing all noncompliant forces, this sardonic and witty nontraditional soldier finds himself part warrior, part journalist." "[A] book that stands quite tall in the literature of that conflict to date." "This is a book you NEED to read." "Gripping memoir... My War proves that the best blogs really can become the best books." "My War: Killing Time in Iraq is a fresh and unique memoir, bridging the gap between the professional soldiers and the disillusioned... Colby Buzzell has written one of the strongest and most creatively constructed memoirs to date... My War is still one of the best memoirs written about the Iraq War... It is recommended to junior officers and NCOs who want to understand the new type of soldiers they are leading into combat..."
"If military recruitment is down now, wait till the kids read this book." "Defiant... this is an exploration of our nation at its most raw and browbeaten... Wrestling with the demons of real past failures and imagined future ones, he finds solace in the clarity of the present, one that demands nothing more than to keep moving...The pages of Lost in America soak themselves in whiskey shots and cigarette smoke, as Buzzell pursues the intoxicated underbelly of the various cities and towns he visits… Whatever one thinks of Buzzell’s worldview and the means he uses to elicit opinions from the people he meets, just know it’s genuine—something bizarrely refreshing, despite all its grime." "Buzzell's voice--tough, jaded, sardonic... speaks for a generation unmoored by economic stagnation and diminishing opportunity." "A gift for seeing the seamier side of life as an adventure in a lower key... Buzzell is a useful mix of scholar and tramp, serving as an interesting travel guide because he access places most of us wouldn't go and then tells the story straight.... a shrewd observer of some things the rest of us would otherwise miss... He's complicated. Talking to him on the telephone for this article, he seems like the kind of guy you'd want your sister to date. He never once swears during a thirty minute phone call, gives openhearted answers to the most pointed questions and seems more charmingly self-deprecating than the least bit swaggering..."
"In a voice that is blunt, sarcastic and viscerally honest... searching for what was once the American dream... Buzzell writes with a jolting, unique voice." "A witty, fearless, sharp-eyed chronicler of America in decline. Buzzell exhibits a Henry Miller-like talent for the memorable character sketch." "Lost in America appealed to me HUGELY... You can tell the author is pretty damned depressed and feeling utterly directionless, it comes across with painful clarity in his writing. He’s genuinely lost in America, and the America he's travelling through feels pretty lost too. He doesn’t know where to go and it seems like there really is nowhere to go. He doesn’t seek out the ‘good’ places to present to the reader, instead he gravitates naturally towards the hopeless and the lost and the misfits." "Lost in America: A Dead End Journey... an account of his cross-country voyage in a problematic 1965 Mercury Comet. Although the book began as an effort to retrace Jack Kerouac's trip from On the Road, Buzzell flipped the assignment on its head by driving from the West Coast into America's midsection." "Equipped with whiskey, nicotine and a ’65 Mercury Comet, Buzzell prodded the under belly of our ailing nation. Scanning a panorama of forgotten towns filled with lost souls, juke joints and flop houses, he examined the mood and character of his fellow countrymen and wrote of his observations… It is the story of America, big prosperity, decline and now trauma." "Some passages are more effective than others, and none is better than the one from army specialist Colby Buzzell, who discusses manning a Bradley vehicle through an ambush in Mosul; Robbins tells his tale through a series of comic-book-like graphic sketches." "One of the best segments, a stark comic-style animation that accompanies Colby Buzzell's piece, "Men in Black," actually adds to the experience of the reading. Actually, an entire documentary about Buzzell, who wrote a popular anonymous blog from the frontlines before his commanding officers found out about it, would have been interesting. " "Several cinematic techniques are employed to realize these tales beyond straight-ahead re-creations. The most distinctive is “Men in Black” by Colby Buzzell, which utilizes a kind of animatic process to present a harrowing street fight, with animated bullets and spent cartridges flying out of the weapons of still illustrations. It's the most vulgar of the lot, with plenty of profanity to heighten the intensity. Most distressing, though, is that after he returned home, he stopped telling people he was in Iraq, because they didn't seem all that interested." "Watching this video actually made my eyes water. The animated short — titled "Men in Black" — shows how intense, terrifying, and confusing combat can be." "These are the reflections of a real person who is scared and grappling with doing things most Americans couldn’t even imagine doing… Colby's story preserves the truth of his war experience and consequently includes blunt language." 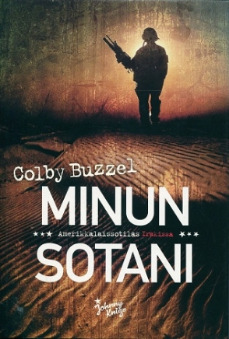 "Former military blogger Colby Buzzell's high-octane tale of a street shootout is accompanied by still-frame, comic-book-style animation, while Marine Lt. Col. Mike Strobl's simple story about escorting a dead Marine's remains back to his Wyoming hometown is set against peaceful, unpopulated footage of the locations, ending with the dead soldier's grave. On the evidence, I'd guess that Buzzell is a war critic and Strobl is a gung-ho patriot, but I can't be quite sure and it doesn't much matter. Hearing their stories in their own words -- something few of us, pro- or antiwar, bother to do -- is the entire point." “Play the Game” by Colby Buzzell follows a returnee to the outskirts of Los Angeles whose sly humor masks strange perceptions surrounding his missing car; the instinct to stereotype others, key to survival when much of overseas combat lies in identifying a disguised enemy, alienates him, a guy who is himself conscious of being conflated with stereotypes in the eyes of well-meaning or outright patronizing civilians." "Colby Buzzell’s “Play the Game”... the protagonist undermine his self-examination with irreverent humor. He is lampooned in the final twist of the story. This has a powerfully revealing effect, deepening our understanding of how strange it can feel to return to civilian life." "If you’re been paying attention at all, then you’ll know that our vets today are killing themselves in record numbers. And yet there’s no suicide story in this collection. Colby Buzzell’s “Play the Game” comes close..."
"Play the Game" by Colby Buzzell (my heart absolutely stopped when I came to the last sentence of these paragraphs)"
"Colby Buzzell’s “Play the Game” has a veteran take a job as a streetside sign-holder in Los Angeles as he lives a “temporary,” novocained existence." "In “Play the Game” Colby Buzzell (author of the memoir, MY WAR: KILLING TIME IN IRAQ) offers a chilling portrait of a futureless veteran who is probably suffering from PTSD, living in a transient LA hotel, drifting aimlessly between dead end jobs." "There are moments of truth in these stories: In Colby Buzzell’s “Play the Game,” the author details the experience of a soldier who returns home to live in a hotel, gets a job waving a sign on street corner, and ends up so drunk that he blacks out, forgets where he parked his car and reports it stolen."